A composite wedding bouquet resembles a giant flower but is created by painstakingly assembling the petals from many flowers with florist’s glue. In many cases, one real blossom forms the center of the bouquet. The effect takes great skill to achieve, but the results are stunning. Not all flowers are suited for the creation of a composite wedding bouquet. Flowers with thick, waxy petals that hold up to extra handling and gluing make the best composite bridal bouquets. 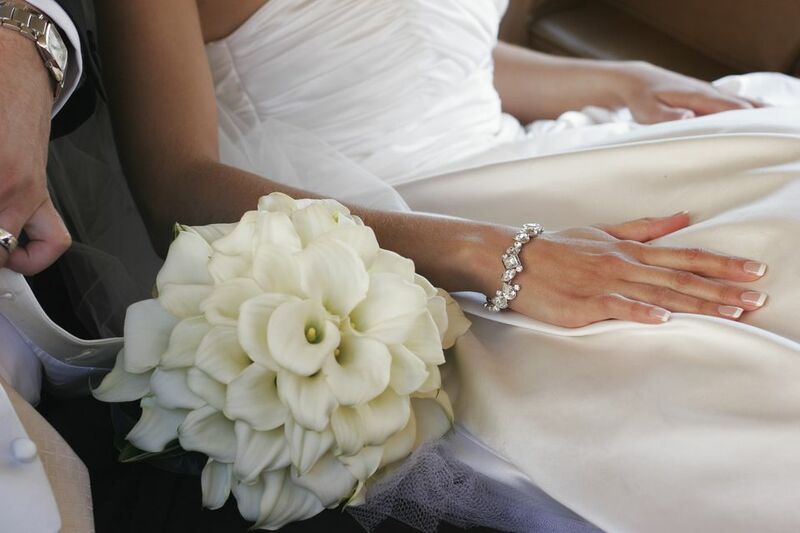 ​Wedding florists often use lilies and orchids create composite bouquets. Flowers with more delicate petals, like roses, are also an option, but may not last through an outdoor wedding and reception. A composite bouquet looks exquisite in its simplest form, but florists can add to the artistry of the arrangement with embellishments. Ask your florist about the possibility of using crystals or pearls in the center of the bouquet, or about tucking feathers amongst the petals. Examples: Katherine Heigl carried a composite bridal bouquet made of white roses and pine for her wedding to Josh Kelley.